Britains Swoppet Knights: Home Page. This website is dedicated to the greatest children's toys of all time, the Swoppet Knights made by William Britains during that halcyon period which we now refer to as the 1960s. From 1959 through to the early 1970s, these masterpieces of British craftsmanship, imagination and ingenuity dominated the make-believe medieval world of many a youngster. Their quality was self-evident, even to a child, their play-value almost limitless, and the fact that each figure was utterly unique gave them a place in the imagination of their childish and innocent owners which no other plaything could emulate. On countless bedroom floors across the land, small armies of Swoppet Knights took part in fictional battles and wars against equally fanciful enemies. The rules were made up on the spot, and the opposition were most likely drawn from other manufacturers' figures or those given away free in cereal packets. In that uncomplicated age when history was a simple subject and all things "medieval" seemed part of some glorious and chivalrous whole, which encompassed William the Conqueror, the Knights of the Round Table, Ivanhoe, El Cid, the Crusades, Robin Hood and the Wars of the Roses (whatever they were about), the Swoppet Knights didn't seem out of place in any era. They were by some way the most expensive items in any young collector's toybox. For most kids, one dismounted figure cost a week's pocket money, and you had to save up for ages to afford a Knight on horseback. The boxed sets - well, you had to hope some rich relative would buy you one for Christmas or your birthday. But quality was always successful against quantity in those naïve days, and, if the odds appeared to be stacked against the Swoppet Knights, it never mattered. Whatever semi-real or fanciful cause they were fighting for, the Swoppet Knights, being in some indefinable, unscientific way well nigh invincible, always won their battles. Time and again, the four mounted warriors and half a dozen footmen would see off armies several times their size but composed of plainly inferior troops. That's how it was on my bedroom floor anyway. This website does not claim to be anything like a definitive repository of all knowledge about the Swoppet Knights, nor does the Author claim to be an expert, just an enthusiast. There being no other source of information on the subject on the Internet, it seemed like a good idea to make an attempt at gathering all the available material into one site, and make it accessible to the public, in the hope that any errors or omissions (and there will be many) can be corrected by the readership. Thus, hopefully, future versions of the site can work towards becoming an authoritative document about these fascinating and complex models that took such a hold on so many children's imaginations so many years ago. At least, such is the intention. The site, if you choose to follow the pages in order, starts with a look at the History of the Swoppets, from the merger between Herald and Britains in the late 1950s through to the displacement of production to Hong Kong in the early 1970s. It then goes on to examine each of the Swoppet Knight Models in some detail. This is followed by the Equipment page, which looks at each item of Swoppet Knight accoutrements, and lists all the variations of form and colour that are known. There is a page devoted to the Horses, with details of the colour variations of the Swoppet Knights' steeds. A separate page is given over to the Ancient Siege Engines which Britains produced to accompany the Knights. In order to put the Swoppet Knights in perspective, an overview of the period to which they ostensibly belong, the Wars of the Roses, is included. Then perhaps a fairly subjective view of some of the Swops that work well with these figures. Finally, there is a brief Links page, mainly for the use of anyone who wants to know where Swoppet Knights can be obtained in this day and age. Wanted: Pictures of any Swoppet Knights, especially rarities, not covered by this web site. 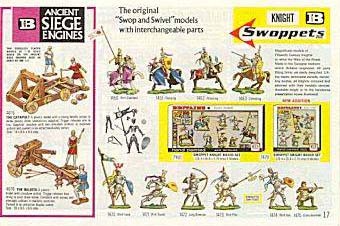 Also, large scale scans of early Britains catalogues (pre-1965) or other promotional material, especially the pages with the Swoppet Knights on them. Please send to the email address below. Any information always gratefully received and acknowledged. This site: Text and HTML © Steve Burns 2002-2007, all rights reserved. Photos are mainly my own work, except where credited. The author can be contacted by email by clicking here.